The All New, All Daring Delusional Honesty! : The Hulk Is 50. Join Me In An Incredible Celebration! This sounds great! I've been a Hulk fan since age 5 and will most certainly be picking this up. Do try to interview Peter David, as I'm particularly fond of his Gray Hulk run. I support this idea completely. I'm no HULK fan but I want to see this happen. Awesome Gary, can't wait! Hopefully a Nook version will be available too? TNO821, stay tuned! Some news in that regard just around the corner. Ryan, I'll make a convert out of you yet! When your project is ready, just let me know & I'm there. Phillyradiogeek, I'm looking into getting this thing on Smashwords, too, so people of the non-Kindle persuasion can find it easily. Cool? I'm wondering if "The Complete Hulk 1962-2003" makes an appearance in this book? Hey John, you get a special thanks in the book. The bibliography in the back will include a listing of every appearance of the Hulk, and I couldn't have compiled it without your original listing from your MS. It's been renovated, reformatted, and updated like crazy. This is awesome Gary, I'll be looking forward to it!!! Puny Bug-Eyes! Hulk thought Bug-Eyes was Hulk's friend! Now, Bug-Eyes wants to steal Hulk's birthday!?!?!? For that, Bug-Eyes - Hulk will smash!!! Bug-Eyes thinks he is special because puny humans call him uh-may-zing...but Hulk is the strongest one there is! Hey Gary, you think you could make an ipad/iphone app with this book? I would definitely buy it. Gary, I'm very, very excited about this announcement. I'm not much for digital, but I want to be first in line for any conceivable print version of this book. The Incredible Hulk #191 was the very first issue to call out to me and jump off the rack into my grubby, little hands. I've been a huge, hulking fan ever since. Best of luck on this endeavor, good sir. bravo, i wish you well on your endeavor and congratulations on the hard work. as for ideas? well i dunno if you could incorporate something like this but i've recently ordered a book ("Zona") describing a movie, except it's actually a book about the author remembering HIMSELF watching the movie. might you be able to incorporate some "once removed" commentary (i.e. not just what the hulk did or how he behaved in a story/series of stories) but what your recollections are now of your initial reactions then? and how they now seem e.g., simple, awe-inspired, frightened, childish, profound, etc? and perhaps a re-reading of selected issues in this light, to see how your adult mind has re-assessed them? just a thought, perhaps this could add an enjoyable angle for you, it would for this reader anyway. good luck and thanks for your blog, peter h.
I too wish to join you in celebration for The Hulk's 50th Anniversary milestone. It's just a shame that it seems that Marvel is overlooking such an important moment in one of their most popular character's existence. It's sad, but at least I know other Hulk fans are around to celebrate. So... you're writing a special project involving the Green Goliath? Interesting... in a very good way! Here's a few ideas, though I don't know if you've thought of them already or not, but I might as well get them out. Have you've considered interviewing some of the great artists who worked on the Hulk through the years such as Herb Trimpe, Sal Buscema, Dale Keown, Lee Weeks, Carlo Pagulayan, Paul Pelletier, etc.? Have you thought of not only the Bruce Banner/The Hulk's future, but considered the future of his villains (The Leader, Abomination, Lord Armageddon/Lord Arma'Chedon, Bi-Beast, Wendigo, etc. ), his friends and family (Jennifer Walters/She-Hulk, Skaar, Rick Jones/A-Bomb, Lyra/Savage She-Hulk, Doc Samson, etc. ), and the women he has loved (Caiera the Oldstrong, Betty Ross Banner/Red She-Hulk, Jarella, Kate Waynesboro, etc.) both in comics and in general? That's the only two that I can think of off the top of my head. I'll let you know if I think of any more. Until then, I wish you the best of luck and I hope 2012 is a year that we shall all celebrate the creation of an epic emerald-skinned titan who has changed the lives of so many around the world and continues to do so to this very day. Take care, my friend and fellow Hulk fan. 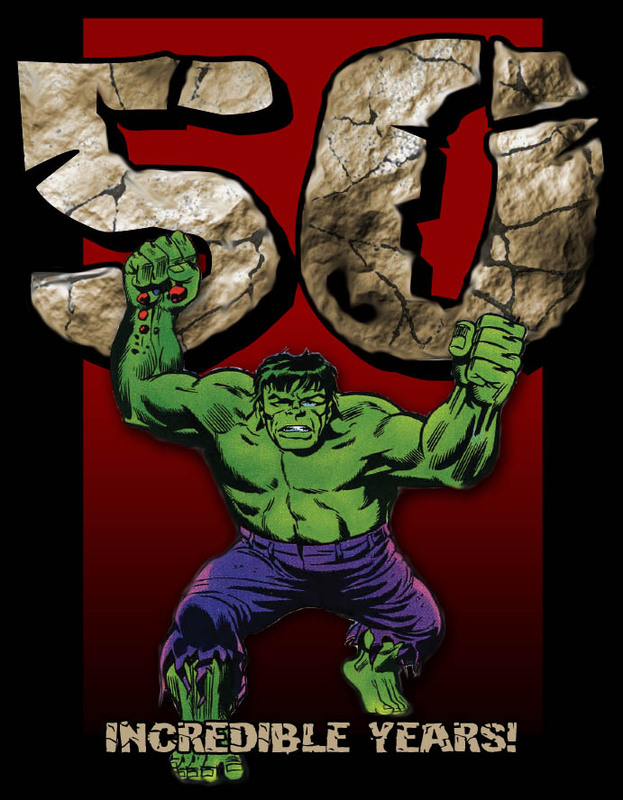 Cheers to HULK for 50 years: 2012!!!!! Thank you G. for sharing this, you rock!!! You have the approval of the Halls of Hulk- ScrabbleHulk Has Spoken!